Yum, yum, yum!!! Our last meal before leaving Los Feliz had to be brunch at Little Dom’s. We’d meant to get there earlier but better late than never. On the weekend you can expect to queue, so do make a reservation. As you probably guessed, I did not make a reservation, that would have required a little pre-thought. Luckily, it was only a 15 min wait but people after us were being told 30-45. – breakfast pizza!!! So good. I had a real fancy for pizza and was trying to convince Al we should get one “for later” (they do breakfast & lunch all day) but with a breakfast pizza there was no dispute! The pizza had the thinnest crust – almost as thin as a crepe. 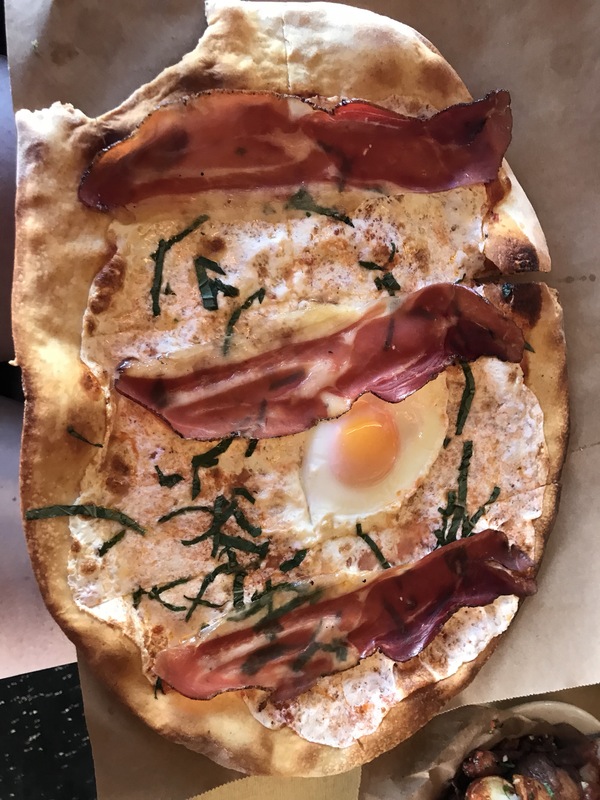 As you can see it had a fried egg in the middle, a light mozzarella, and speck. Really, good. And huge, there were leftovers. 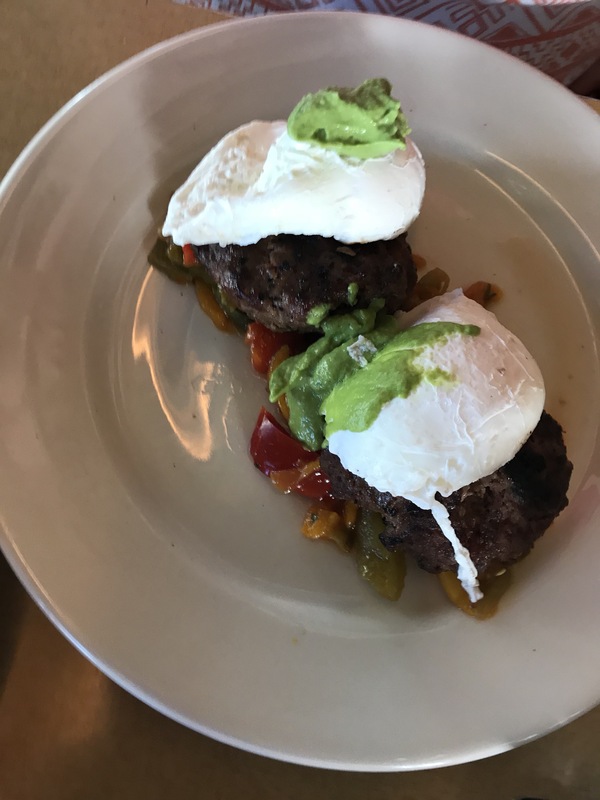 – grilled meatballs with poached eggs. The meatballs were like big homemade rissoles on top of some roasted/grilled capsicum and poached eggs. Plus they actually ask you how you want your eggs toasted! 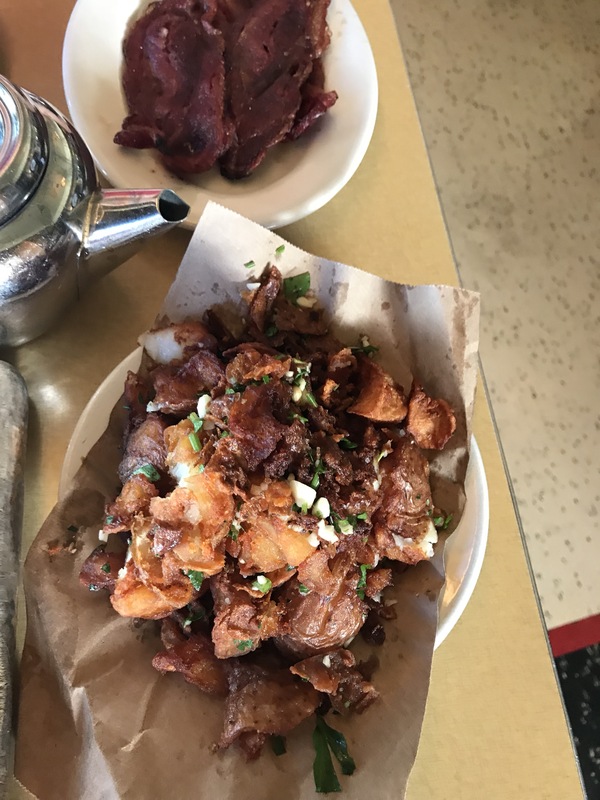 Naturally we had to add a few sides 🐷🐷 we added the wild boar bacon and the fried potatoes. The bacon has a gamey taste and a bit of chew to rather than crisp, but Al liked it. The potatoes were to die for!! Super crispy, a little garlic and a hint of lemon. Little Dom’s is a definite winner. I feel like I could happily eat my way through their whole menu. And I haven’t even looked at dinner! Though I did see there was a lasagna night with my name on it. Los Feliz has got some cute little shops so afterwards you can walk off your pigging out.